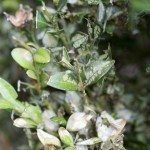 I can't find 10-6-4 fertilizer or anything specifically for boxwoods. Can you suggest specific commercial products? What about Jobes 4-4-4? I have been using Ironite Plus 12-10-10 every spring.